Ankle Brace provides medial and lateral support to stabilize the ankle joint for faster recovery and healing of tender soft tissues. 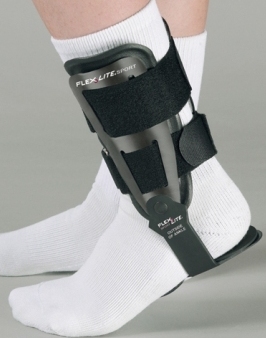 The Hinged Ankle Brace provides ankle stability to weak or injured ankles. Articulating hinges glide smoothly and allow for full, unrestricted foot flexion, which is the preferred design among therapists and trainers. Lightweight support shells with padded formed foam liners give maximum stabilization to the ankle joint in a sleek, low profile design. Integrated elastic straps provide a secure fit with no movement. 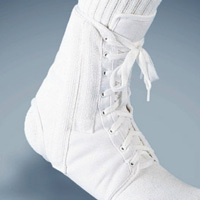 Makes a great preventative brace during activity to help reduce the chance of sprains or strains. 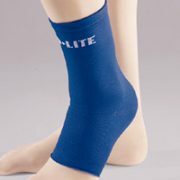 Ideal for sports and to support weak or injured ankles. Made of lightweight, low profile nylon material for long-lasting wear. Extra ankle stabilization with internal figure-eight straps that are preconfigured to ensure correct placement every time. Application is quick and easy. Comfortably fits in athletic shoes. Elastic back. Fits left or right. This Ankle Brace provides medial and lateral support to stabilize the ankle joint for faster recovery and healing of tender soft tissues. 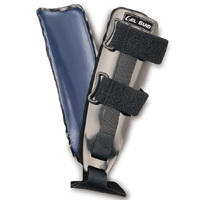 Ideal brace for mild or moderate sprains, strains, or after cast removal. The liner is made of a tri-layer pneumatic air bladder that conforms to the ankle and pulsates while walking to provide a massaging effect. Standard height. Adjustable heel piece conforms to fit a range of sizes. Two adjustable swivel straps ensure proper stap placement each time brace is applied. Universal size that fits left or right. The GelBand Stirrup Ankle Brace provides medial and lateral support to stabilize the ankle joint. 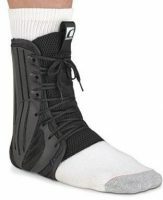 Indicated to support the ankle following sprains, strains or after cast removal. 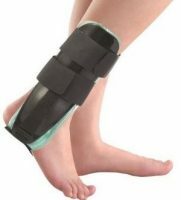 Ideal brace for mild or moderate ankle sprains since it is easily removed and adjustable to account for changes in swelling. 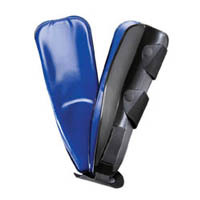 The rigid brace shells are designed to fit the ankle comfortably and provide the needed medial/lateral stabilization. The overall brace has a sleek, slim profile and can be easily worn with most athletic shoes. Brace liner is made of a unique viscoelastic gel material. This gel conforms to the ankle and will never leak, breakdown or cause any uncomfortable pressure points.